It's time to rise and shine!! If you're not always feeling bright eyed when the sun starts to rise, here's a few suggestions for giving your morning routine a little boost of ease and energy! You knew this one was coming, didn't you? I know, I know, it's easy to stay up and burn the midnight oil, but resist the late nights and get to sleep. Our bodies are often functioning on a lack of sleep and this contributes to more than just the ability to get out of bed easily in the morning. Studies show that getting the right amount of sleep (somewhere between 7-9 hours) is directly linked to increased focus and mental clarity, faster metabolism, and lower levels of stress. Also, our bodies repair and rejuvenate while we sleep, and by looking at the pace most of us keep on a daily basis, this is essential! When you're feeling like you're in a fog during the day, or find it hard to get out of bed every morning, you probably need to get some rest, so skip the evening scrolling, and get to sleep! Our bodies are meant to react and respond to light--specific colors/rays of light--which helps to let us know when it is time to be up and active and when it is time to start winding down. In the mornings, the light rays are usually growing increasingly more blue which generates the response from the body to wake up and be active. As the sun begins to set, the light rays become more red and orange, generating the signal to the body to start winding down and getting ready for rest. Our devices (phones/ipads/tv/computer screens) emit a high percentage of blue light which is great during the day; however, this does not help us get our bodies into rest mode in the evenings. To get a better night's rest and an easier wake up, sleep researchers suggest limiting your screen time in the evenings and completely cutting it out at least an hour before bed. It's much easier to quiet your mind and body if you're not constantly consuming social media feeds right before you get to sleep, so put that phone down, unplug, and relax. Morning exercise is one of the best ways to start the day, and a great way to get into the habit of becoming a morning person. Getting the body going when you wake up is essential to starting the day out on a positive note, and I have found that it gives me increased energy and focus throughout the rest of my day. Also, I've noticed that when I workout in the mornings, I tend to eat much healthier during the day, and have less cravings. In addition, morning workouts have become a great time for doing some thinking/visualization, prayer, and getting some time to myself before the start of a busy day. Cultivating this habit has helped to make mornings enjoyable and gives a sense of accomplishment as the day begins. Mornings can sometimes be a little rushed and even stressful if you're not properly prepared. One way that combats this craziness is to plan ahead and get things ready the night before. I like to lay out my gym clothes and running shoes along with any specific things I need for the day ahead. When you're prepared, you are able to enjoy the morning and use the time for something beneficial. A great way to enjoy the morning is to start the day off with gratitude. Instead of focusing on all the stress of the week or things that are happening in the world, cultivate a spirit of thankfulness for the many things you have been blessed with. By focusing on the positive, you're setting the tone for the day ahead. Take a moment to journal, sip your coffee, and make a list (either on paper or in your head) of at least 5-7 things you are grateful for. This habit does wonders for your mind and spirit. 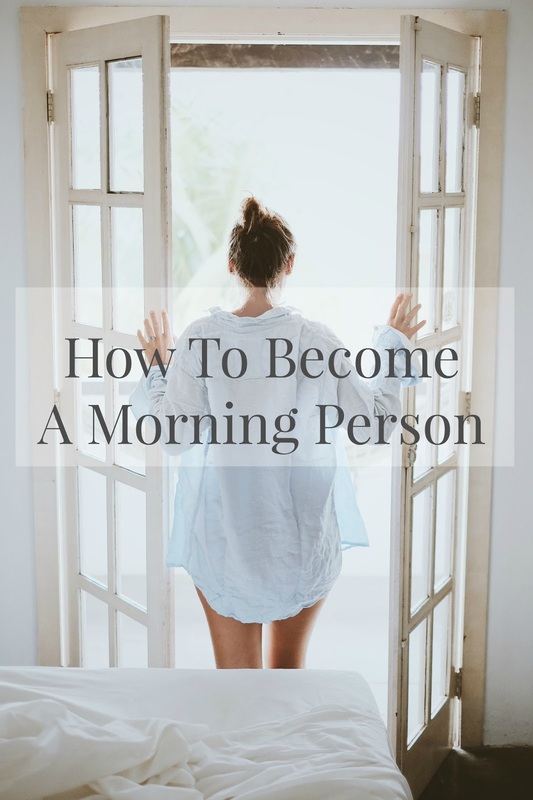 Mornings can be productive, enjoyable, and something to look forward to, but it may take a little bit of planning and rearranging of some habit patterns. Changing your habits and mindset is certainly a process, so if it seems like an adjustment to get into the 'I'm a morning person' routine, that is ok! With proper planning and consistency, you'll start each day with excitement and fulfillment!